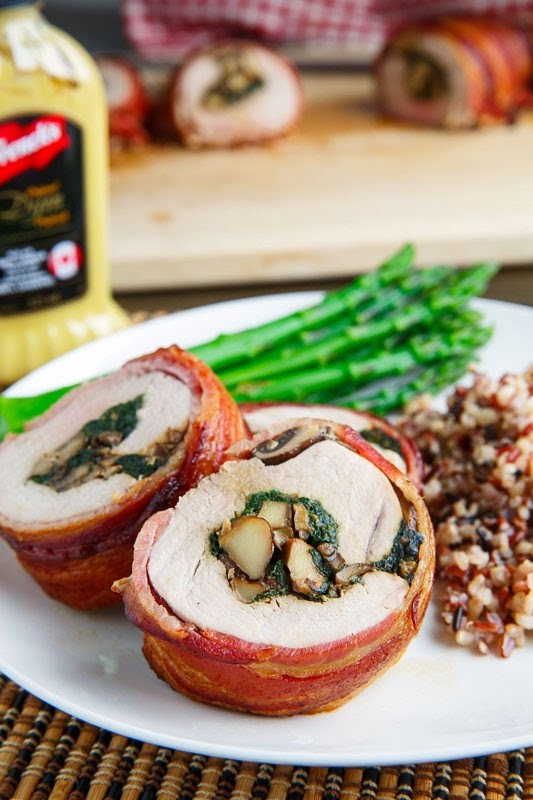 Juicy pork tenderloin wrapped in crispy bacon and stuffed with a tasty mixture of mushrooms and spinach all smothered in a creamy goat cheese and French’s Dijon mustard sauce. Easter is right around the corner and that means that it’s time to start planning your Easter dinner! Quite often it’s a ham dinner but are you a little tired of ham? 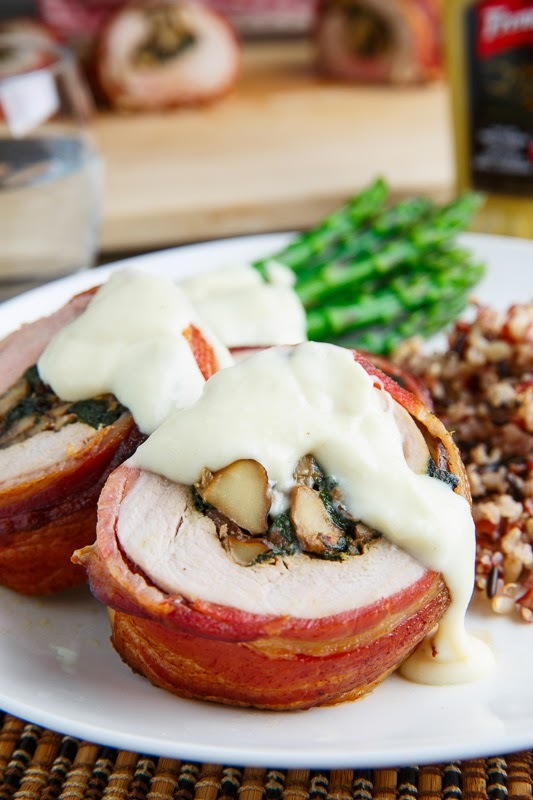 How about trying something new like this bacon wrapped, mushroom and spinach stuffed pork tenderloin in a creamy dijon goat cheese sauce? Sometimes pork tenderloin can be a bit dry but when you wrap it in bacon it keeps it nice and moist and juicy so it’s perfect every time! 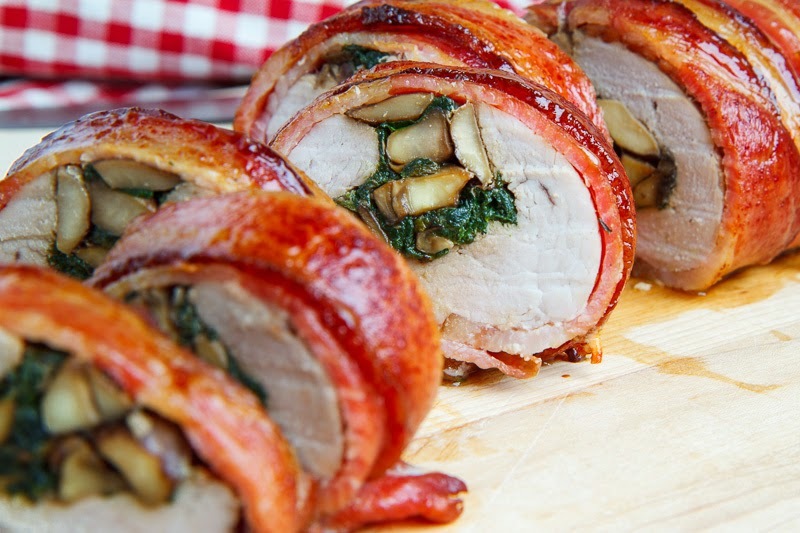 Not only do we have pork tenderloin wrapped in bacon but it’s also stuffed with a tasty mixture of sauted mushrooms and spinach seasoned with garlic and thyme which complements the pork and bacon nicely. Now you might be thinking that stuffing a pork tenderloin is difficult but it’s actually quite easy, you just cut the tenderloin down the side, open it up and pound it with a mallet until it’s thin (pounding it is a great stress reliever and a little fun), place the filling on it and roll it up. Next up is wrapping it in bacon and baking it until the pork is cooked and the bacon is oh so nice and crispy! This pork tenderloin is amazing just like that but it’s just begging for a creamy and tangy sauce like a dijon goat cheese sauce and French’s Dijon mustard is my goto choice! 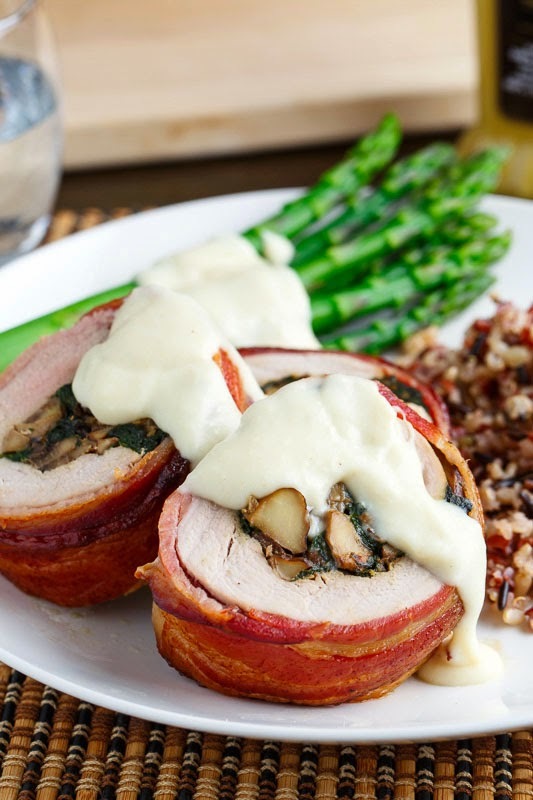 This bacon wrapped, mushroom and spinach stuffed pork tenderloin in a creamy dijon goat cheese sauce will make the perfect centre piece for your Easter dinner! 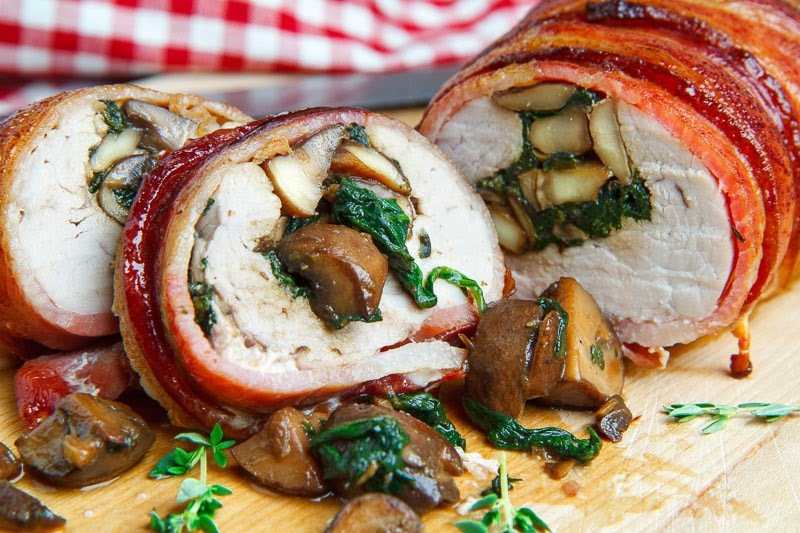 The mushroom and spinach combo is such a fabulous one, especially wrapped in succulent pork and bacon! French’s Dijon mustard really makes this sauce shine! Melt the butter and heat the oil in a pan over medium-high heat, add the onion and mushrooms and cook until the mushrooms have released their liquids and the liquid has evaporated, about 10-15 minutes, before adding the garlic and thyme, cooking until fragrant, about a minute, and seasoning with salt and pepper to taste. Add the spinach, let it wilt, use the water released from the spinach to deglaze the pan and continue cooking until the water has evaporated, about 3-5 minutes, before setting aside. Cut the tenderloin lengthwise almost all of the way through leaving about 1/2 an inch, before opening it and pounding it with a kitchen mallet until it is evenly thin, about 1/2 inch. Spread the filling over the tenderloin leaving 1/2 inch around the edges and roll it up lengthwise before wrapping it with bacon. Tip: Spread the bacon out over parchment paper with the edges overlapping a bit, place the rolled up tenderloin on it and use the parchment paper to help easily roll the bacon around the tenderloin. Place the tenderloin on a rack on a baking sheet with the seam down and bake in a preheated 400F/200C oven until it reaches 145F-160F depending on how well done you want it, about 40 minutes. If the bacon is not perfectly crispy, broil for a few minutes until it is. Remove from oven, cover in foil and let it rest for 10 minutes before slicing and serving topped with the sauce. Meanwhile, melt the butter in a sauce pan over medium heat until frothing, mix in the flour and cook until lightly golden brown before adding the milk and cooking until it thickens. Add the goat cheese and cook until it melts before mixing in the lemon juice, mustard and seasoning with salt and pepper to taste. Disclaimer: This post was brought to you by the makers of French’s Dijon Mustard. I received compensation to write this post through the French’s Easter Program … all opinions expressed are my own. That cheese sauce is calling my name! This recipe is wonderful Kevin!!! Why isn't all pork wrapped in bacon?? And that sauce! I'm loving that sauce.. looks delicious. I recently started liking goat cheese. This looks fantastic! I can't wait to try this! So tired of ham! Bring on the bacon wrapped pork! Love this, Kevin! Kevin these look out of this world!! Kevin, this is absolutely stunning!!!! This is the ultimate Easter dinner!!!! I love it love it for easter kevin . keep up the good work . The Pork is fabulous but 4 oz. of fresh Spinach is plenty. The sauce though was very disappointing. It was tasteless, didn't add anything to the lovely stuffed Pork. You can make a white wine cream sauce that is a much better accompaniment to the Pork. Sauté some yellow onion, deglaze with 1/2 cup white wine. Once reduced pour in 250 – 500 ml heavy cream, add 1-2 cloves finely grated garlic. Once nicely reduced to a light sauce consistency grind in fresh pepper to taste and add 1/2 cup Parmesan cheese and a bit of chopped Parsley, reduce heat to low. Serve over the Pork. A simple tossed salad is a perfect side! Making this tonight, will let you know!